Military families usually live on a very tight budget, so putting together a Christmas or other winter holiday celebration can be a real challenge for some of them. This is where the Soldiers' Angels Adopt-A-Family program comes in. Through this program, Soldiers' Angels matches military families with sponsors who "adopt" the family for the holidays. The sponsor will provide presents for the children and a grocery gift card or prepaid Visa gift card for the family to purchase their holiday dinner and trimmings. All military families registering must complete registration by Tuesday, December 8th at 5:00 pm CT. Family Registrations will close at that time. Volunteers may still register to adopt families after that date. 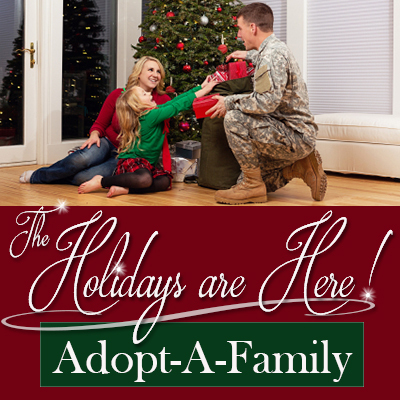 For more information for military families or those interested in adopting a military family, please visit the Soldiers' Angels Adopt-a-Family Team page.